Latvia will adopt the euro from January, joining a currency union that was fending off talk of disintegration just a year ago. Latvia will adopt the euro from the beginning of next year, becoming the 18th member of a currency union that just a year ago risked disintegration due to the credit crisis. European Union finance ministers gave the ex-Soviet state on the Baltic Sea the green light Tuesday to swap its currency -- the lat -- for euros starting on Jan. 1, following recommendations from EU officials and the European Central Bank. Latvia gained its independence from the Soviet Union in 1991 and joined the EU and NATO in 2004. It has a population of two million -- nearly 30% of Russian origin -- and annual gross domestic product of 22 billion euros ($28 billion), equivalent to just 0.2% of eurozone output. It will be the fourth smallest member of the currency area, ahead of Cyprus, Estonia and Malta. Talk of a eurozone break up reached fever pitch early last year as a political crisis in Greece threatened to torpedo its rescue by EU partners and the International Monetary Fund. The ECB's pledge in July 2012 to backstop the euro restored market calm. But nerves were jangled again earlier this year when the Mediterranean island of Cyprus went into meltdown, triggering a bailout that imposed losses on savers, a massive downsizing of its banking industry and an aggressive austerity program. Latvia's accession -- the first since Baltic neighbor Estonia joined in 2011 -- is a vote of confidence in the world's biggest currency union, which is still grappling with recession and record unemployment, and represents a dramatic turnaround in fortunes for the new euro member. Latvia's economy shrank by about 20% in 2008 and 2009, when it was forced to accept a $10 billion bailout from the EU and International Monetary Fund after the global financial crisis burst a real estate bubble. But it kept the lat pegged to the euro throughout the crisis and introduced a series of spending cuts and tax rises aimed at meeting the strict criteria of eurozone membership. The economy began to recover in 2011 and last year it delivered growth of 5.6%, compared with a decline of 0.6% for the 17-member eurozone. While the economy is expected to slow next year, expansion of 3.8% should still make it the strongest performer by a wide margin. Unemployment is slightly above the regional average, and a relatively high proportion of the population is at risk of poverty, but with a budget deficit well below 3% of GDP and debt forecast to fall to 35% of GDP by 2016, Latvia is better placed than many eurozone states to tackle those challenges. The Latvian government is hoping the introduction of the euro will boost growth by attracting more foreign investment to the country but risks remain. Like Cyprus, Latvia's banking sector has attracted big deposits from Russia in recent years -- and may well have sucked up more displaced by the Cyprus crisis. The ECB has expressed concern about the level of foreign deposits in Latvia's banks but analysts say the industry is nowhere near as bloated as it was in Cyprus and Latvia can count on a much stronger economy and healthier finances. 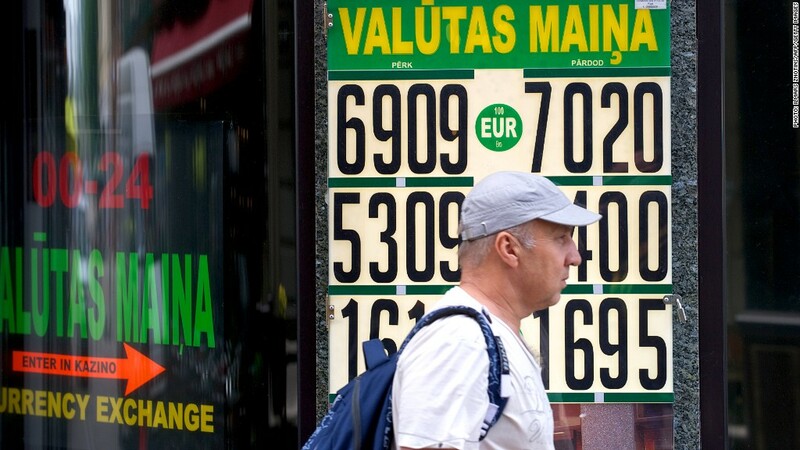 Latvia's other Baltic neighbor, Lithuania, is hoping to join the euro in 2015.